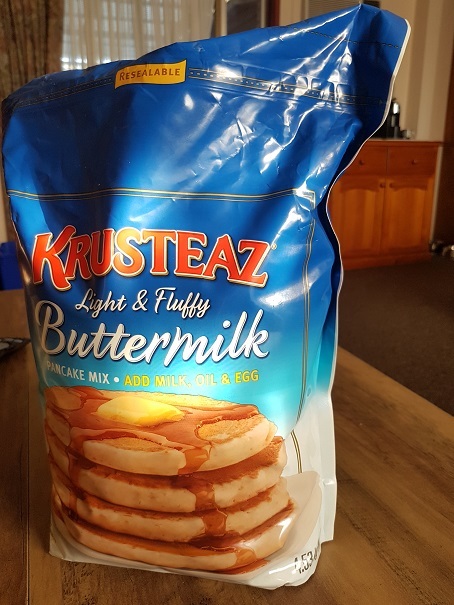 Tiff bought a big bag of pancake mix from Costco ages ago. It's past the useby date but it's still sealed up and I'm confident that it's fine. Do you know if there's anything else I can use this mix for? My first thought was waffles but I've only made those with a recipe. What do you think? ...could I use it just like flour and make biscuits/cookies out of it? Might it be the same as Bisquik? Seems a shame to waste it. What would you do with it? There's 10lb of it! Krustaez is a good brand. I buy their brownie mix all the time. Never bought their pancake mix. With bisquik you can make pancakes or biscuits, I used to buy it years ago when I used to make pancakes for my kids. I have to agree with alliek, oil could be rancy and it may not rise. How long out of date is it ? Just an FYI, I just checked the internet and you can also get mold in the pancake / waffle mix and sometimes it is not visible and it can make you sick, worst case if you turn out to be allergic it can kill. It all depends on how long out of date the mix is and under what condition it was stored. I am not posting this to scare anybody, just for information, take it for what it is worth and make your decision. I don't buy Bisquik anymore, just the 2 of us. If we want pancakes for breakfast we go out to our local diner. I store mine in the fridge. If it’s expired, I pitch it. Not worth the chance of getting sick. It has a Best Before date of 1.1.2018. It's been stored in a cool pantry. I'll test it. I had forgotten it was even there. I think I'll throw it out... I'm annoyed that I wasted it. Tiff used to make crepes but I didn't intend her to buy another packet. I didn't think of keeping pancake mix in the freezer... excellent idea which I'll do if ever there is a next time. I could divide the packet up into serving sizes. In the meantime I'll just pretend that I never had it. Thanks everyone for your advice... Much appreciated. Yes. I'm with Allie. I would seal it well and freeze it . I freeze a LOT of foods. The only odd thing I freeze is instant coffee. I should throw it out because I never use it. I prefer coffee from my pod machine. I really need to have a cleanout of everything out of date. I'm not usually a hoarder of anything... except maybe knitting yarn but that's not a hoard, that's a treasure... *LOL* I'm sure there are other packets of mixes of some sort that should be tossed. *ROTFLOL* I love the way you think, Hayburner! There are many times when I feel like I have the devil sitting on my shoulder. The man who installed our gutter guard today was here for 10 hours and it's stinking hot outside. By the time he finished he was down to wearing just a little pair of shorts. That devil kept telling me that if I was 40 years younger I might have sat outside watching him... I reminded the 'devil' that I'm old enough to be his grandmother! You could also contact the company. Their website will give you other recipes as well.